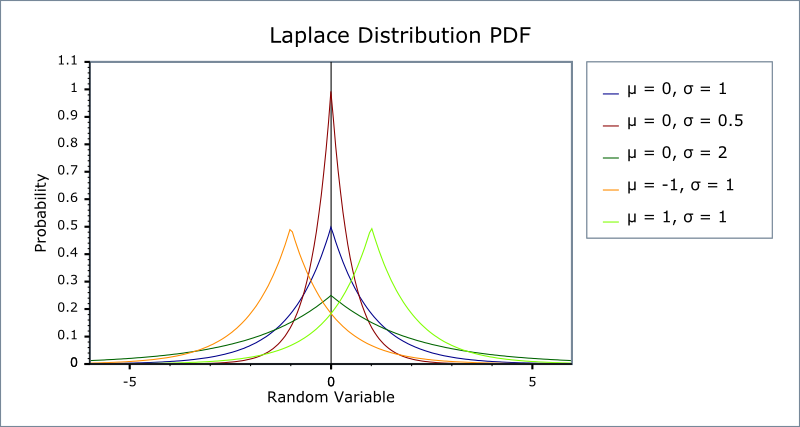 Laplace distribution is the distribution of differences between two independent variates with identical exponential distributions (Abramowitz and Stegun 1972, p. 930). It is also called the double exponential distribution. The location and scale parameters are equivalent to the mean and standard deviation of the normal or Gaussian distribution. Constructs a laplace distribution with location location and scale scale. The location parameter is the same as the mean of the random variate. The scale parameter is proportional to the standard deviation of the random variate. Requires that the scale parameter is greater than zero, otherwise calls domain_error. Returns the location parameter of this distribution. Returns the scale parameter of this distribution. The domain of the random variable is [-∞,+∞]. The laplace distribution is implemented in terms of the standard library log and exp functions and as such should have very small errors. In the following table μ is the location parameter of the distribution, σ is its scale parameter, x is the random variate, p is the probability and its complement q = 1-p.
Weisstein, Eric W. "Laplace Distribution." From MathWorld--A Wolfram Web Resource. M. Abramowitz and I. A. Stegun, Handbook of Mathematical Functions, 1972, p. 930.